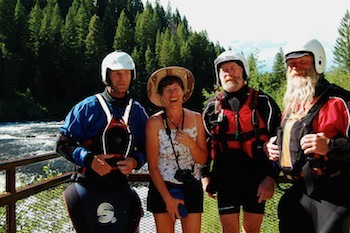 Mid-July, 2012 – We left the corner of Wyoming near Afton and journeyed north into Idaho. We were doing our route planning to take in as many official “scenic byways” as possible, so now we followed Idaho’s Teton Scenic Byway. We had been to Grand Teton National Park at the beginning of our travels in 2007 and had been awe-struck by the jagged beauty and majesty of the mountain peaks. The national park is on the eastern side of the mountains in Wyoming, and its roads wind right along the base of the mountains. 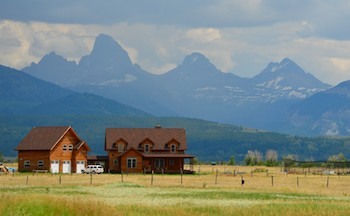 The Teton Scenic Byway in Idaho is on the western side and the road is much further distant from the mountains, running right through the rich valley farmlands. The views were lovely, but unfortunately the sky and lighting didn’t cooperate with us on that particular day, and the smoke from nearby wildfires made the mountains hazy at best. But a real highlight was to drive through fields and fields of perfectly spaced, rolling rows of green plants. “What do you think that is?” I asked Mark. “Hmmm….” He mused. 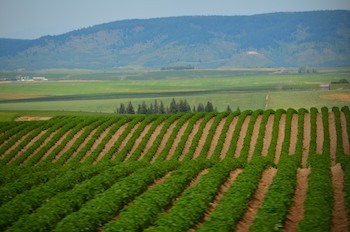 “This is Idaho… which is spud country… Idaho potatoes maybe? ?” Yup! We soon saw a sign saying that this was “seed potato” country. It explained that many farmers in the area are third and fourth generation seed potato farmers and that after storing the potatoes through the winter in cool cellars many are cut into 2″ cubes in the spring to create the next season’s crop. Where the Teton Scenic Byway leaves off the Mesa Falls Scenic Byway begins, and we made the turn onto that road. Two beautiful waterfalls give this scenic byway its name. The Lower Falls is very pretty, but the Upper Falls is a stunner. 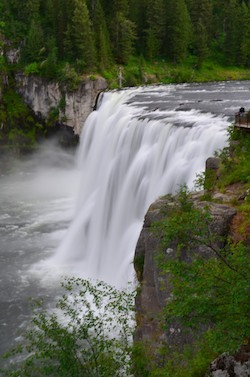 We were glad to have our National Park Pass because these falls are one of those “federal lands” area with an entrance fee that is covered by the pass. 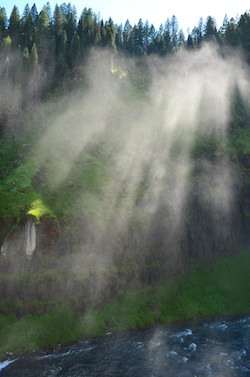 The afternoon light lit up the mist that foamed off of the falls, and we wandered up and down the enormous walkways and stairways that cascade along the edge of the falls for tourists. As we were leaving we noticed three fellows carrying kayaks up the stairs. It turned out they were had just kayaked 8 miles down the river, and apparently that stretch of river is excellent white water and rapids. Fortunately they had stopped short of the falls!! Mark wanted to get a picture of me with them — and when one of them playfully put his arm around me for the shot I discovered he was sopping wet from head to toe! That got me laughing. 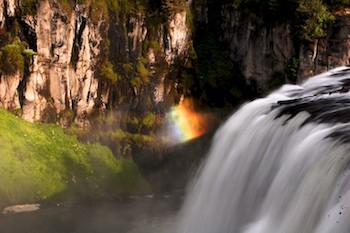 The Upper Falls are known for the rainbow that forms in the mist in the mornings, and we set the alarm to make sure we caught the rainbow at its peak according to what a ranger told us. Out of laziness we hadn’t changed the clocks in the trailer since leaving Arizona two months earlier, but we we knew we were off by an hour. Well, we were off by an hour the other way! So we got to the falls in the freezing cold semi-darkness and were just about frozen to the bone by the time the little rainbow finally made its first showing. The falls create a rainbow each morning. 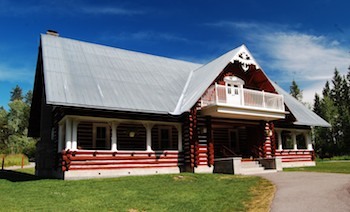 The Upper Falls is also home to the Big Falls Inn, a cool old log cabin built in 1915 by Snake River Electric Light & Power Co. as an office/residence for workers. Big Falls Inn – from the Power Company! as a dance hall, and as a corporate retreat. In 1986 the Forest Service acquired it through a land exchange. 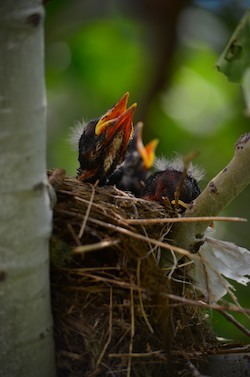 We had simpler accommodations in our buggy nearby, but outside our window a little robin’s nest was full of open-mouthed chicks! Continuing our journey north, our road wandered out of Idaho and into the Bitteroot Valley of Montana. This entry was posted in Idaho and tagged Idaho, Idaho Scenic Drives, Idaho Southeast, Travel, USA, WP Travel by Roads Less Traveled. Bookmark the permalink.